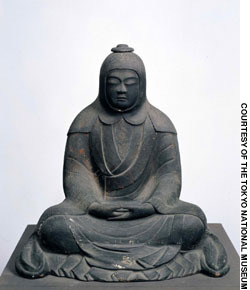 Saicho, besides Kukai, is a remarkle figure in the development of Esoteric Buddhism in Japan. The presend exhibition (see below) was the start of this article. Saicho and Treasures of Tendai"
posthumously known as Dengyo Daishi ("Great Teacher who Transmitted the Teachings"), established the Tendai Sect in Japan in 806 (Enryaku 25), under the imperial sanction of Emperor Kanmu. Saicho had statues of Yakushi in each of the four ships on his way to and from China and prayers were said for a safe trip. This year marks the 1,200th anniversary of the founding of the Buddhist Tendai sect in Japan, when Priest Saicho (767-822), posthumously known as Dengyo Daishi, received court permission to establish a school of religious study and training at Enryaku-ji Temple on Mount Hie to the northeast of Kyoto. The purpose of the center was to train spiritual leaders, since -- according to Saicho's book "Essential Teachings for the Priests of the Tendai Hokke Sect" -- "one who can illuminate even one corner in the world . . . is a National Treasure." In commemoration, a major exhibition, "Faith and Syncretism: Saicho and Treasures of Tendai," is at the Tokyo National Museum till May 7, showing sculptures, paintings, calligraphy and other religious objects selected mainly from temples throughout the country. Saicho's connection with Mount Hie dates from when he was 19 years old, at which time -- disgusted with the degenerate state of the Buddhist clergy at temples in and around the old capital of Nara -- he built a cottage on the mountain and devoted himself to the ascetic study of original Buddhist teachings. Two or three years later, he established a temple on Mount Hie, just shortly before the Imperial Court moved to Kyoto. Thereafter, for religious, and possibly political, reasons he managed to attract Imperial patronage, and in 802 was sent to study at Mount Tiantai in southwest China. There, Saicho immersed himself in the study of the Lotus Sutra (considered the ultimate teaching of the historic Buddha, but probably written sometime after his death), together with Esoteric Buddhism and Zen. On returning to Mount Hie, he unified what he had learned with local Shinto beliefs, and from this syncretism (meaning "the unification of various religious beliefs") he developed a new form of Tendai Buddhism more suitable for Japanese followers. Despite the bewildering complexity of Tendai philosophy and practice, its central belief is that all sentient beings are bodhisattvas who can become enlightened Buddhas and gain entrance to Paradise. This revelation had a tremendous effect on Buddhism during the Heian Period (794-1185), as religious hope and opportunity -- which previously had been considered almost exclusive to the clergy and court ranks -- became accessible to everyone. Saicho's syncretism was nevertheless far from final, and religious debate continued during his life and after his death. The Tendai sect spread throughout Japan, inspiring artists and craftsmen to produce a huge variety of adornments for temples and sculptural and pictorial images for didactic purposes. 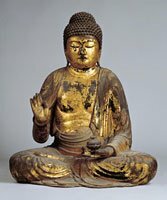 It also provided an intellectual and spiritual environment that spawned further new sects with their own interpretations of Saicho's teachings, including Jodo and Nichiren -- which emphasized ritual, prayer and religious practice -- and Soto and Rinzai Zen -- which stressed a personal spiritual search through meditation. These sects in turn refined religious doctrines to suit their own ideals, and are still extant today. The original Tendai complex on Mount Hie grew in time to the size of a small city that, at its peak, supported some 3,000 sub-temples and an army of militant warrior-monks famed for challenging political and religious opponents at every opportunity. The complex is now a designated World Heritage Site and still serves as the Tendai headquarters for more than 19 million members who follow "the perfect teaching" of native beliefs mixed with the Buddhism that Saicho studied in China. Most of the temples that can be seen today date from the late 16th and early 17th century, having been rebuilt after the daimyo Oda Nobunaga destroyed the Enryaku-ji complex in 1571 in an attempt to unite the country by eliminating all his rivals. In the exhibition, several paintings, and a beautiful small wooden sculpture from the Kannon-ji Temple, portray Saicho himself. All show him full-fleshed and round-faced with downcast eyes, and just a trace of a furrow at his brow to suggest concern for the enormous job he shouldered. 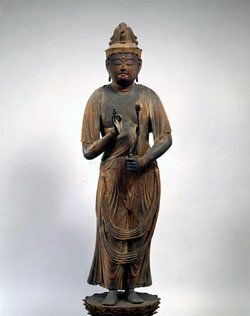 Other sculptural highlights include a standing figure of Kannon clutching a lotus bud from Enryaku-ji, with a serene expression and a third eye of inlaid crystal -- as well as a rarely revealed, seated, gilded Buddha of Healing from Zensui-ji Temple. Both of these masterpieces are being shown away from their temples for the first time. The diversity of Tendai religious images is extraordinary and reveals an all-embracing reverence of Buddhas, bodhisattvas and guardian deities, as well as members of the native Shinto pantheon that were already long established. One of the delights is a 12th-century crouching monkey carved in wood that represents a "Messenger of the Gods of the Mount Hie Shrines." Other images are more fearful, and serve to warn of what can happen to those who stray from the path. 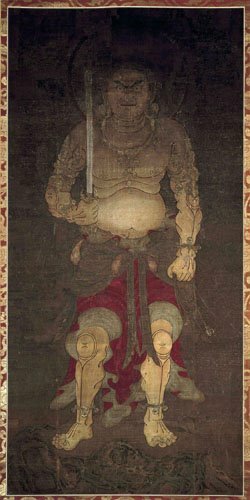 A Heian Period painting of Fudo Myo shows the muscled "immovable" guardian of Buddha's doctrine, wide-eyed and grimacing, sword at the ready, in strange uplighting to emphasize his otherworldly nature. And if his warning isn't sufficient, graphic scenes of Hell's torments should serve to nudge the criminally inclined back to the straight and narrow path. Nevertheless, hope and salvation is the underlying message of Tendai, and one recurring painted image is that of the enlightened Amida Raigo swooping down on a cloud, surrounded by attendant deities -- sometimes accompanied by a heavenly orchestra -- to pluck a deserving soul from Earth "in the blink of an eye." To fully understand the symbolism and meaning of the objects displayed in this exhibition would take lengthy study, and for the nonspecialist much would be lost in translation. Many of them are, however, artistically sublime and can be appreciated subjectively for their beauty alone. Many of the exhibits are rarely shown at all, and some have been rediscovered as a result of a special study of Tendai by scholars at the Kyoto National Museum. A few are now designated "National Treasures," but for Priest Saicho, such words described not esteemed art works ranked by bureaucrats, but those early masters of Tendai who devoted their lives to trying to shed light in the shadowy corners of spiritual fate. is a mountain to the northeast of Kyoto, lying on the border between the Kyoto and Shiga prefectures, Japan. For much of Japanese history, Mt. Hiei has been off-limits to women. The temple of Enryaku-ji, the first Japanese outpost of Tendai sect of Buddhism, was founded atop Mount Hiei by Saichō in 788. Both Nichiren and Honen studied at the temple before leaving to start their own practices. The temple complex was razed by Oda Nobunaga in 1571 to quell the rising power of the Tendai's warrior monks (sōhei), but it was rebuilt and remains the Tendai headquarters to this day. is a Tendai monastery located on Mount Hiei, overlooking Kyoto. It was founded during the early Heian period. The temple complex was established by Saichō (767–822), also known as Dengyō Daishi, who introduced the Tendai sect of Mahayana Buddhism to Japan from China. One day in the year 806 the priest Dengyo Daishi Saicho, on his way home from China, saw a golden light east of the Ariake Sea. He climbed the East Mountain to find this sacred light deep in the forest. On his way he encountered great hardship and even lost his way. Suddenly, a male pheasant came by and showed him the way. Saicho found a shining "silk tree" nemu no ki 合歓木, carved a Kannon Bosatsu with 1000 arms into this tree and build a temple nearby. This is the origin of the pheasant toy at the temple. In Quest of the Eternal Shakyamuni"
. "What is national treasure?" . "shining light into one corner is itself a national treasure." Dengyo Daishi has been given lectures about the Lotus Sutra and performed rituals for his parents. He used 13 days for the celebrations, which was later shortened to 10 days and after the Meiji period to only 5 days. Nowadays the priest in charge sits at a special high podest and talks to the laypeople. This hokku was written late in the 11th month (December) in 1814, a few months after Issa had gotten married, while he was on a trip back to Edo to say farewell to his poet friends there before moving to his hometown for good. There were various celebrations on 11/23-24, but there was a difference between those for believers in the Tendai-school of Buddhism and for those who celebrated a more general Saints' Festival. In Tendai-school Buddhist temples in Japan 11/24 is celebrated as the memorial day of the Chinese founder of the Tiantai school of Buddhism, Zhiyi (538-97). Early in the 9th century this school was transmitted to Japan by Saint Dengyo and called Tendai, and in Japan Zhiyi, called Chigi in Japanese, was most commonly referred to as Tendai Daishi (Saint Tendai). On 11/23-24 (late December) many different beliefs intersected in a way that made the special watery rice gruel with red beans and sometimes noodles in it that Issa writes about more than simply a part of a memorial service for a single saint. Japanese folk religion is unabashedly syncretistic and vigorously incorporates various different elements into contradictory yet vibrant systems of belief and ritual performance. The most important celebration on this day was a festival called Daishi-kou (大師講), or Saints' Festival. The festival began with supper on 11/23, when special rice gruel with red beans in it called "Saint's gruel (daishi-gayu)" was served, and this festival rice was also served on the 24th. Outside of Tendai temples, other Buddhist saints, such as Saint Kobo, Saint Sangan, and Shotoku Taishi, were also worshiped, though their memorial dates were at other times of the year, and in some areas a one-legged god was worshiped instead of a Buddhist saint. In Edo and in northern Honshu, the festival also often included prayers said at the time of the winter solstice, and the festival rice gruel was believed to strengthen people and protect them from the big snowstorms which usually began around the time of the winter solstice and the Saints' Festival. Issa's diary doesn't mention stopping at a temple on 11/23 or 11/24, and the context of the hokku doesn't suggest a Tendai temple. However, Issa surely knows who Saint Tendai was, because both Honen and Shinran, the founders of the two schools of Pure Land Buddhism in Japan, began as Tendai-school monks who were later expelled as heretics. Issa may even have read some of Saint Tendai's lectures on meditation and higher wisdom, the famous Maka-shikan (摩訶止観), although the True Pure Land Sect did not stress the crucial importance of meditation. In any case, Issa does not feel that his knowledge gives him deeper insight into the meaning of the festival. Issa no doubt saw many people simply eating the rice gruel with red beans in it on 11/23-24 and he himself was surely served some at the place where he stopped for the night. Perhaps the joy felt by the people around him eating the delicious gruel -- eating it as if they were worshiping it, even though they do not know the doctrines of Saint Tendai and the other saints worshiped on this day -- reminds Issa of the "other-power" that is the source of all movement toward the Pure Land. Since Issa doesn't practice any specific meditation or claim to have any special wisdom, perhaps he includes himself among those who "don't know."
. WKD : Rice gruel (kayu　粥) . The KIMON for the city of Kyoto was the double-peaked Mt. Hiei.
. Hokedake-Ji, Hokkedakeji 法華嶽寺 Hokedake Yakushi-Ji . I shield it with my black sleeves. At the temple Enryaku-Ji on Mount Hieizan in Kyoto there is an "eternal flame" and all lanterns are kept alight since more than 1000 years. so the flame could continue to light the temple and show the way to enlightenment for the visitors. yudan taiteki 油断大敵 Do not be inattentive. Don't be too sure of yourself! Overconfidence [ Carelessness] can be very dangerous. Unpreparedness is one's greatest enemy.
. yudan taiteki 油断大敵 - amulet . Written in 1690 in Kyoto. Most probably as an inscription on a painting. shoya (soya) 初夜 , lit. "first night", refers to the "double-hour of the dog" 戌の刻, now about 9 in the evening. As the night grows deeper, the wind grows stronger and the plovers have flown away. It can also mean the "first night" of a newly-wedded couple.
. WKD : oroshi 颪. おろし WIND in various kigo . Oohie, Ô-Hie 大比叡 O-Hie refers to Mount Hiei-zan in general and also to the higher peak of the two main mountain ranges. 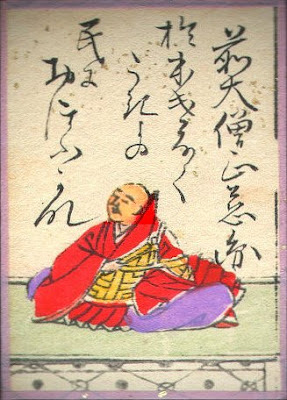 Ikkyū (一休宗純, Ikkyū Sōjun, Ikkyu Sojun . of Satsuki . . . The month of satsuki, the fifth lunar month, now famous for both the rainy season rain (samidare 五月雨) and the few spells of fine weather (satsuki-bare 五月晴). Now it is the weather of July/beginning of June. Written the fifth lunar month in 1688 貞亨5年5月. Basho had most probably been invited to the estate of Namura Saida 苗村宰陀 by the lake side. umi 海 refers to the lake Biwako, the biggest lake of Japan. Thanks for introducing the KIMON ! In ancient Japan, the term Yase Doji referred to the people who lived in the Yase district of Kyoto and worked for the area's Enryaku temple. Despite their plebeian status, Yase Doji were prosperous and maintained strong connections with those in power, including emperors, aristocrats and shogun. After the Meiji Era, they were even entrusted by the government to be the imperial koshi (palanquin) bearers. Jirobo first lived at Mount Hieizan 比叡山 (see below) but was driven away from by priest Saicho and the stronger mountain priests and moved on to 比良山 Hirasan in Shiga. He came all the way from China to challenge the Tengu of Japan. First he went to 愛宕山 Atagoyama to see Nichiraboo 日羅坊 Nichira-Bo, Nichirabo (Taroboo 太郎坊 Taro-Bo). 比叡山 法性坊 - Hosei-Bo and others. They were much more powerful then Zegai-Bo, and he was beaten very strongly by a young novice. He even burned his wings. He was hurt badly but the kind Tengu eventually tried to heal him in a hot bath in Kamogawa 加茂川に湯屋. When he was better, they even organized a large good-bye party for him. Then he returned to China. He was priest 覚海 Kakukai (1142 - 1223) at 比叡山 Hieizan and turned into a Tengu. 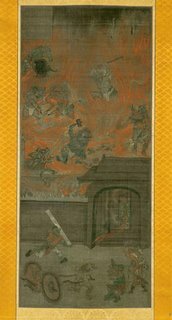 Junichiro Tanizaki wrote a short story entitled "Kakukai Shoin Tengu ni naru koto". When priest Dengyo Daishi was on his way back from China, his ship experienced strong wind and rain. 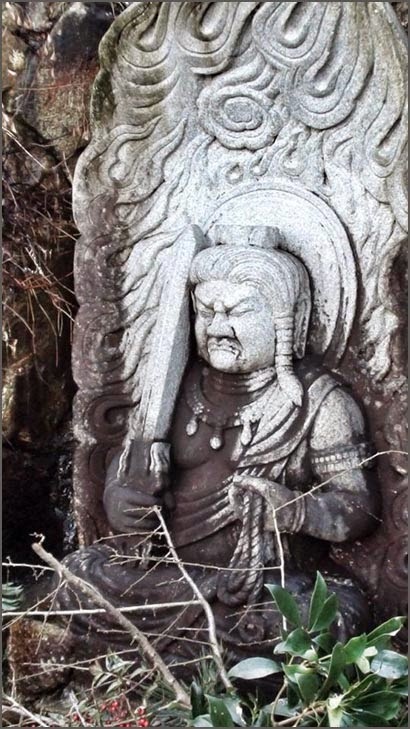 He carved a statue of Fudo Myo-o with the prayer to save the boat and threw it into the waters. He arrived safely in Japan (and later founded the Tendai sect). The statue was picked up on the beach of 越後出雲崎 Izumosaki in Echigo in 858. Saranuma (swamp of plates) is located in the North-East of Arakawa and has been under the control of the Edo Bakufu Government.